As the weather gets warmer, the longing for fresh and citrusy seafood becomes more prominent. In a landlocked state you must be choosy when it comes to finding delicious and fresh seafood. 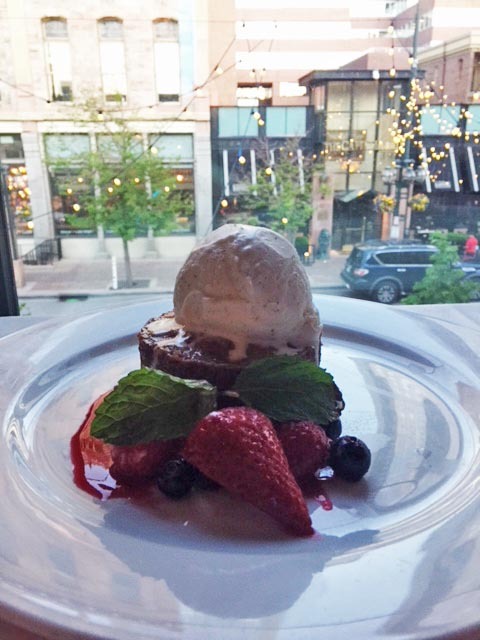 That is why I was quick to accept an invitation to satisfy these cravings at Ocean Prime in Larimer Square at the heart of Downtown Denver. They not only offer notably fresh seafood, but have on-shore options as well. The evening was nothing short of enchanting. We arrived a bit early for our reservation, so we took a seat in the lively OP Lounge where we mulled over the Prime Cocktails menu and gazed dreamily at all of the fun offerings. ALL Prime Cocktails are $10 during happy hour. Our server was knowledgable and quick to suggest the most popular drinks that would provide us with a fun experience. We ordered the BLACK ORCHID which had the perfect mixture of Belvedere Wild Berry Vodka, St Germaine, fresh lemon and white cranberry juice. It was both beautiful and refreshing. 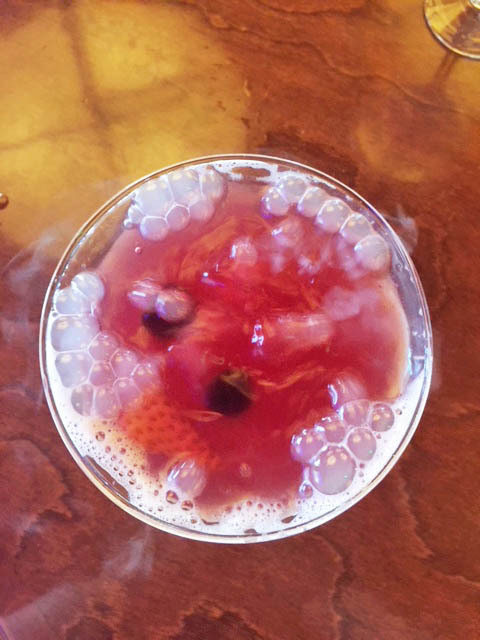 The second cocktail, called BERRIES & BUBBLES, was delicious and entertaining. Both drinks were poured by the server at the table. The BERRIES & BUBBLES came out like a mysterious witches brew! As the liquid was poured into the glass, it began to bubble and smoke over the edges. It was beautiful and we saw many of them served at the tables around us throughout the evening. This is a cocktail you MUST experience when visiting Ocean Prime! Once seated at our table, we satisfied our thirst with a round of Rosé, Grenache, Notorious Pink. This still and not-too-sweet rosé made a perfect pairing for our dinner. It also made me excited for Ocean Prime’s summer promotion, Stop and Sip the Rosé! Starting Friday March 25, they will provide special pricing on a variety of rosé by the glass, including both sparkling and still options. They will also have half priced glasses of Veuve Cliquot Rosé during happy hour on Friday’s throughout the summer. I don’t know about you but that is my ideal ending to the week! 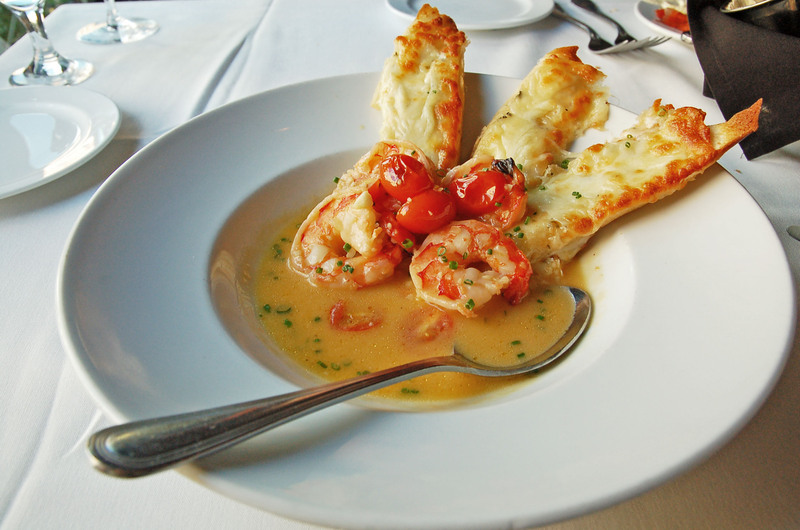 I was brought back from daydreaming about rosé when our appetizer of SHRIMP SAUTÉ arrived. Four perfectly cooked shrimp were bathed in a tabasco cream sauce and accompanied by three enormous slices of delectable cheese bread. Oh baby! The bottom of the bread was soaking up the sauce and was a perfect compliment to the plump shrimp. We also shared a house salad which was larger than expected and gave way as a perfectly crisp and creamy start to our meal. 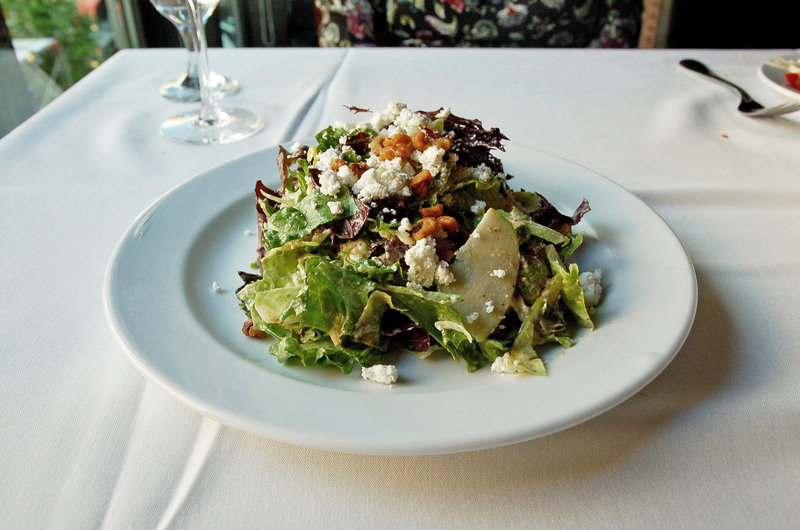 The OCEAN PRIME HOUSE SALAD is a bed of romaine nestled with shavings of granny smith apples, walnuts and goat cheese, tossed in a sherry mustard vinaigrette. It was so delicious, we were unsure of whether we would be able to continue with our next items after we licked the plate clean! Alas, we made room and pushed forward. For our main course we enjoyed the LEMON SWORDFISH and the ever so popular SURF & TURF. Both were incredible. The swordfish was perfectly cooked, both moist and flaky. 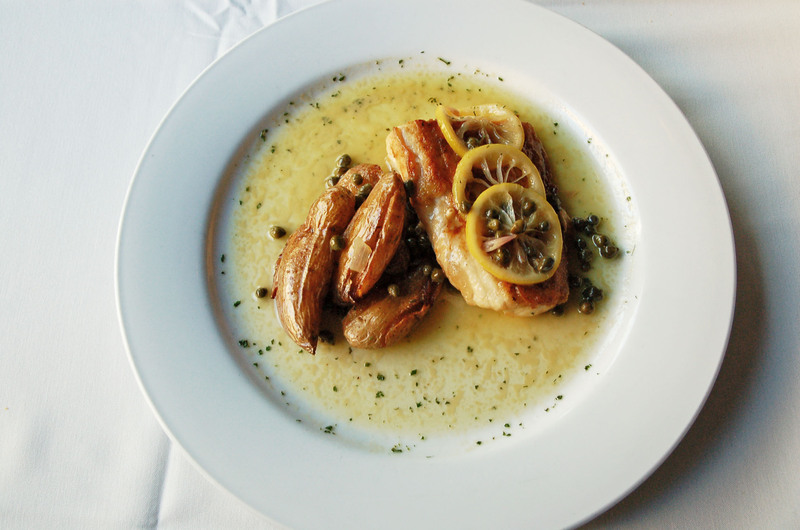 It was highlighted by a lemon caper reduction that people only dream of. The buttery sauce spread out underneath the neatly placed fingerling potatoes that accompanied the fish, making each bite a masterpiece. 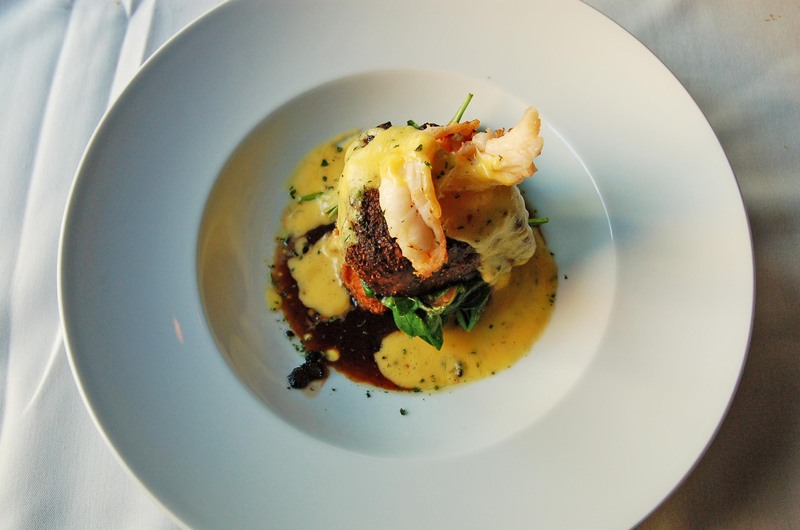 The surf & turf was the perfect combination of land and sea selections. The 8-ounce filet was cooked to perfection and placed neatly atop a bed of chili seared spinach and a crispy potato cake. Perched on top, was a statement piece of butter poached lobster which took the look of the dish to the next level. The plate was drizzled with bernaise and swam in a cabernet truffle reduction. Everything was perfectly seasoned and melded together to make each bite a delight. At this point we were ready to be rolled out of the place. Instead, we tested ourselves once again and ordered dessert. How on earth could we fully enjoy the evening without a sweet bite to end the night? We went with the WARM BUTTER CAKE which is apparently a popular choice, and for a good reason! This cake was indeed fresh and warm out of the oven. It was topped with cold vanilla bean ice cream, drizzled with raspberry sauce and sprinkled with assorted berries. It was heaven on a plate, and to say anything less would be doing a disservice to this lovely piece of art. The whole evening was magnificent! We took our time and enjoyed gazing out on Larimer Square. The lighting from both the white string lights and the bar gave a cozy feeling to the dining room upstairs. This place is a Denver lovers heaven on earth. The service was fantastic. Our server was both knowledgable and kind and left us feeling well taken care of throughout the night. Not only will we be back to Ocean Prime, but we will probably become regulars. Whether you are stopping in for lunch, celebrating a special occasion or looking for a good happy hour. Ocean Prime caters to a variety of diners and continues to change their menu seasonally and offer different promotions throughout the year. They have a great lounge for after work drinks and a patio that you may find yourself sitting on for hours. Whatever the reason for your visit, you will feel well taken care of at Ocean Prime. Previous Post Happy Random Act of Kindness Day!